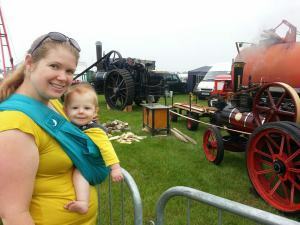 Hi, I’m Sally, a Registered Veterinary Nurse and Mum to 20 month old Reuben. I’ve also trained as a babywearing peer supporter and have just trained as a babywearing consultant. Some of you may know me from my Facebook page, Sling Sally, which I set up to raise awareness of how babywearing can be used as a tool in the management of postnatal depression. And that’s how I find myself giving this talk! So, let’s start with a little bit about me, my background and my journey with depression and babywearing. Having suffered from M.E. for six years throughout my teens, I had suffered depression previously, and at times quite severely. Therefore I was at a higher risk of developing subsequent depression, although it had been over 8 years since any significant problems. By six weeks of pregnancy however, I was beginning to struggle with antenatal depression and this became very severe by the time I was formally diagnosed and treatment began at 20 weeks gestation. I started cognitive behavioural therapy alongside antidepressants, and worked very hard throughout the rest of my pregnancy to get healthy prior to Reu’s birth. By the time Reu was born I had been signed off of the therapy service but remained on a very low dose of antidepressant. With all this in mind I was very aware that postnatal depression was a significant risk for me, and I wanted to do everything I could to avoid it and any long term potential effects for Reu. A major trigger point for depression for me is a loss of independence and feeling like I can’t keep on top of everything that needs doing (we have a large garden to maintain and a lot of animals to care for), and asking for and accepting help is still something I’m working on! So, while I was still pregnant we bought a sling, as we thought this would allow me to get out and do what needed doing with Reuben, hopefully decreasing the risk of relapse. As it happened, the sling had a lot more benefits than we had initially anticipated. Despite poor physical health in the early months after birth, my mental health remained relatively stable, but from about two or three months in I struggled with postnatal depression. I remained on antidepressants and returned to therapy at points, as well as attending a mindfulness for depression course, which was also very helpful. 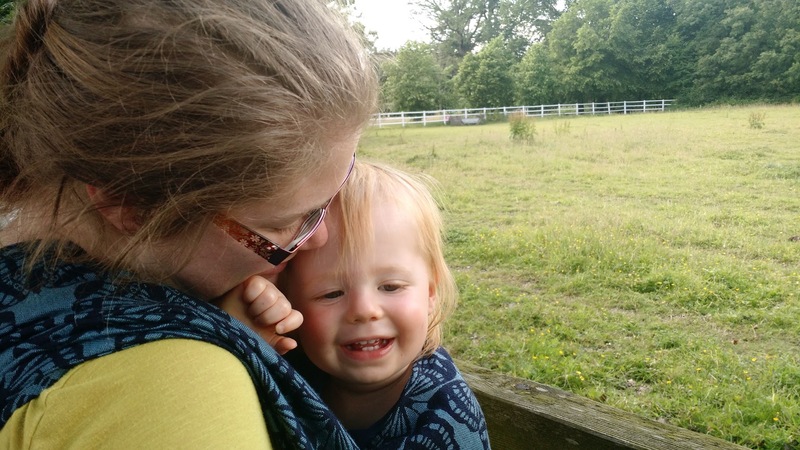 So, back to babywearing and the many different ways it helped me to initially remain healthy, and then to prevent a worse occurrence of the depression, and also to aid my recovery. Due to the antenatal depression I struggled to bond with Reu while I was pregnant, and couldn’t actually picture that I was having a baby until quite late on in my pregnancy. 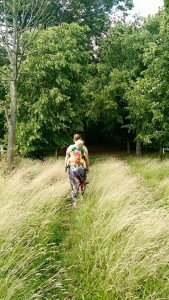 So having Reu so close to me in a sling massively helped with our bonding. It helped us get to know each other as we were always so close and I would constantly tell him what we were up to and what there was to see around us. We now have an incredible bond (without him being clingy! ), and I’m sure this is in part due to us being so physically close so much of the time, especially in the newborn stage. I also love that I can easily teach Reu about everything that we see and do as he can see and experience everything that I can see, and this strengthens our bond as well as reassures me that I’m a good mummy to him. I struggled with some anxiety as part of the depression and babywearing has always helped me to feel that both Reu and I are safe and secure. When Reu is in the sling, I can easily see that he’s safe and all his needs are being met (especially in those early newborn days when everything is new and there’s a lot of new things to process and learn about, this was a major reassurance for me). I also feel much happier about my own safety and well-being when Reu is in a sling on me, it feels like we are within our own bubble of safety and comfort together. A massive benefit for me with babywearing is the independence it gives me. 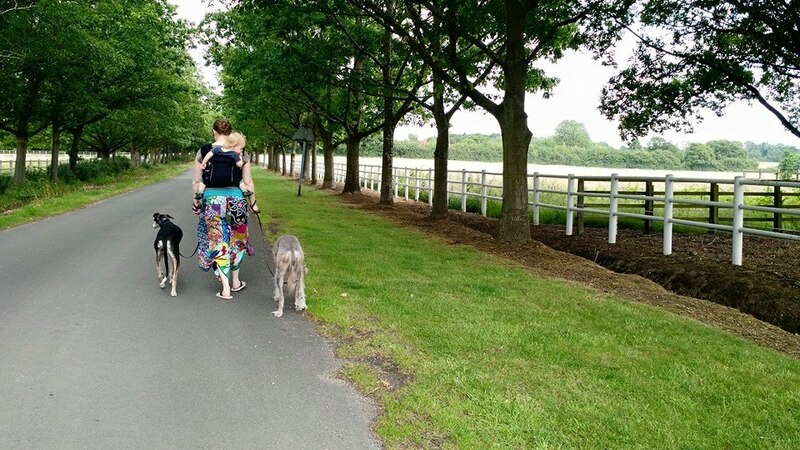 It means I can get out of the house quickly and easily for a walk or any other outing without the hassle of setting up a buggy, or needing to find a wider car parking space to get a car seat in and out. These may seem like small concerns but when struggling with depression or anxiety even these can form blocks that prevent you from getting out of the house, which would of course be of benefit. 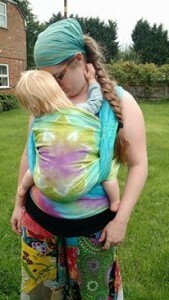 My first sling was a Babasling which is similar in design to a ring sling in that it goes over one shoulder. This meant I could get it on and Reu safely in and ready to go in seconds. Once out it is also much easier to move around in shops, through crowds, up stairs or on less ideal buggy terrain (such as countryside walks or narrow pavements). An extra benefit I found in this regard was that I always felt I had an easy escape if I required it. If I struggled while out with anxiety and I felt the need to get out of the situation quickly, I always knew that with Reu in the sling I could just walk away, as easily as I would if it were just me, and that this isn’t always possible with a buggy as you may need to navigate through crowds or narrow shop aisles for instance. I noticed that a lot of my friends with babies were tied to quite rigid schedules, whereby they had to be home at certain times so their babies could nap in their cots while the parents sat on their own (and often in silence so as not to wake the baby). This would have been a problem for me and a trigger for depression, and it benefits my mood to get out and about without such limitations on time. Reu has always been happy to sleep in the sling, which means we can easily go out for the entire day without worry that I am not fully meeting his needs. I’ve found that having Reu in the sling opens up communication with strangers too. They tend to start talking to him because he’s at eye level with them, or start talking to me about him or the sling. I found this a more comfortable way to have a conversation with strangers, even on low days, as it felt less intimidating to be talking about Reu or slings, rather than me, and by having him on me I felt safer and more confident. There’s also a community element to slings and that can open up conversation to make new friends and form a support network of other parents. There are a lot of on-line groups and I am lucky enough to have two local sling libraries and a local babywearing group who meet up for walks, and there have been several occasions when I have made myself go to a walk when my mood has been low, but have felt much better after a walk and chat with like minded parents, and there’s usually cake involved too! Since becoming involved in the babywearing community I’ve found a new passion that I can share with Reu. I have now trained as a babywearing peer supporter and have just trained as a consultant. I volunteer at two local sling libraries, and through my Facebook page and events like this feel like I’m contributing to helping others who are dealing with postnatal depression or just want to learn how to comfortably carry their children. The satisfaction I get from helping people has been a big help in maintaining my recovery. 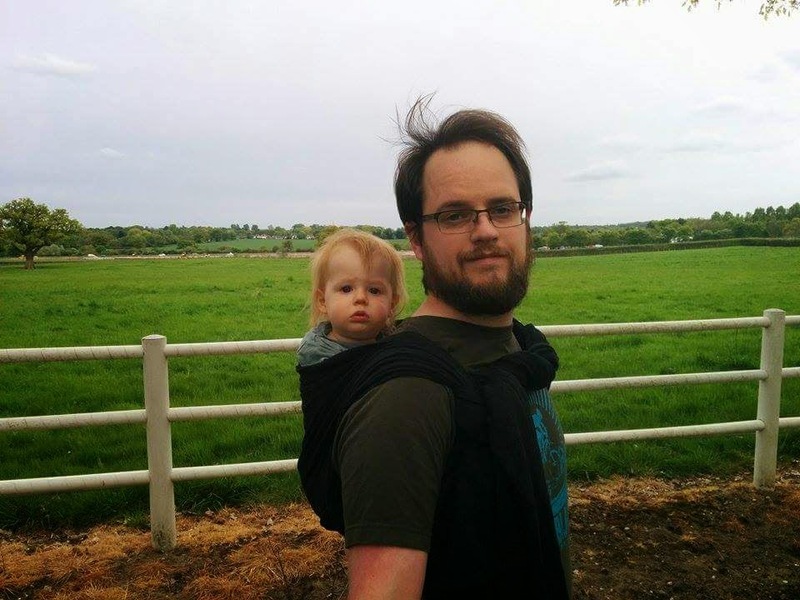 I also asked my husband if he could think of any other ways he feels babywearing has helped and he joked that it has helped us to spend some of our savings! So let’s look at the symptoms of postnatal depression and the ways that babywearing can help with some of these. This is in no way meant to be an exhaustive list of symptoms, and every person’s depression is as individual as the sufferer. I would also like to stress that anyone concerned they may be suffering with any form of depression should seek qualified medical help in the first instance, and that babywearing in this context is aimed as being one of the tools used in recovery or prevention, alongside other treatments such as medications and therapies. I personally found cognitive behaviour therapy, mindfulness and medications to also be very helpful in my recovery. There has been quite a lot of research into the prevalence of postnatal depression in Mothers, which put the numbers of women suffering at between 10 and 15 percent. The prevalence of postnatal depression in Fathers is also starting to be looked at and a recent study (cited by the NHS), stated that around 10 percent of Fathers would also suffer postnatal depression. So there are a lot of parents out there, of either gender, struggling with mental health problems, for whom an ability to greater bond with their baby and meet their needs, while retaining some of their independence could be very helpful as part of their treatment. A major risk factor in the development of any depression is change, specifically a life changing event, and I think all parents would agree that having a baby causes a huge amount of change in both parents lives, so it’s really not surprising that postnatal depression rates are so high in both parents, and many studies have suggested that rates may in reality be higher, due to lack of diagnosis as people are often concerned about admitting how they are feeling. Persistent low mood – The ability to do something you want to do that brings you joy, or at least prior to depression did, whatever that may be, can be a massive help. It’s very easy to focus all of your attention on meeting your baby’s needs and not leave any time or energy left for your own needs, adding to the depression. 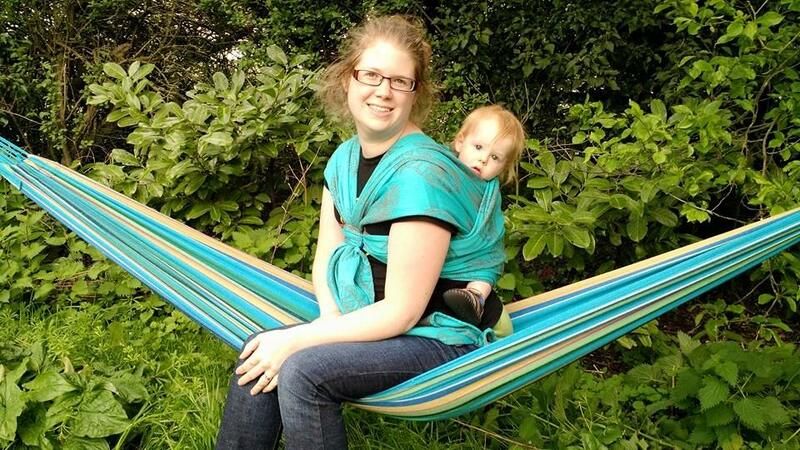 By having your baby on you in a sling you can be meeting both your needs at the same time. You can easily check your baby and know that they are safe, while having two hands free for whatever activity it is that would help your mood. (I wouldn’t recommend snowboarding with your baby, I was more thinking along the lines of reading, walking, crafting etc). On a less enjoyable but still vital to improving mood front, it can also be very overwhelming to be looking at all the tasks that need doing around the home, while for instance sat with a sleeping baby on you. If your baby doesn’t like to sleep away from you (which is a perfectly understandable behaviour from an evolutionary standpoint), then you can easily end up sat down with a sleeping baby on you for hours on end, whilst staring helplessly at the pile of washing, dirty dishes etc. While I’m all for not worrying about having a pristine house (you have a child, it’s just not going to happen), you do still need clothes to wear and dishes to eat from etc. If your baby will sleep in a sling (which most will, looking back to our evolutionary roots again here), then you can chuck a load of washing in the machine, wash up a plate for lunch and maybe even run the hoover round, which should make the house a much more comfortable place to spend time in. Loss of interest in things that used to give pleasure – this is a hard one as if you’ve suffered from depression you’ll know that it’s hard to find the motivation to do something that you’re not currently interested in, even though if you did manage to get yourself to do it, a little bit of the previous enjoyment may be felt, thus encouraging you to continue or repeat the behaviour. 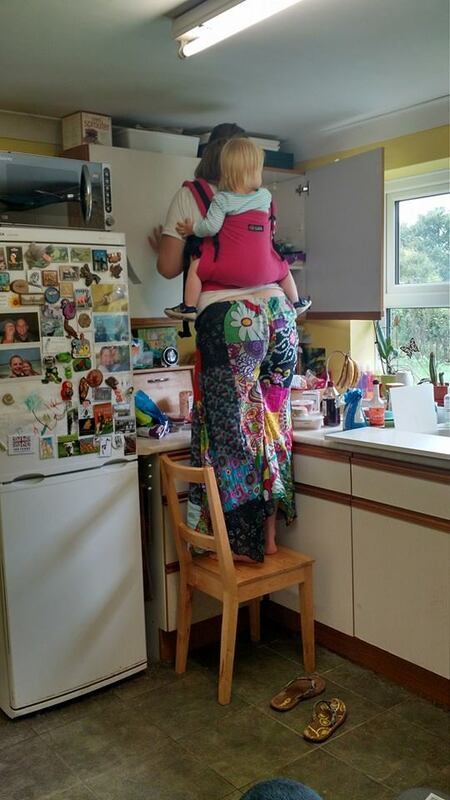 Babywearing in this instance can reduce some of the barriers we put between ourselves and the previously enjoyable activity. 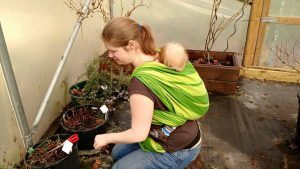 It’s very easy to say ‘I can’t do that, I need to look after the baby’, so using slings in this way can leave you hands free and mobile, and make it that little bit easier to carry out whatever it may be that previously brought you pleasure (again, no snowboarding while babywearing please). 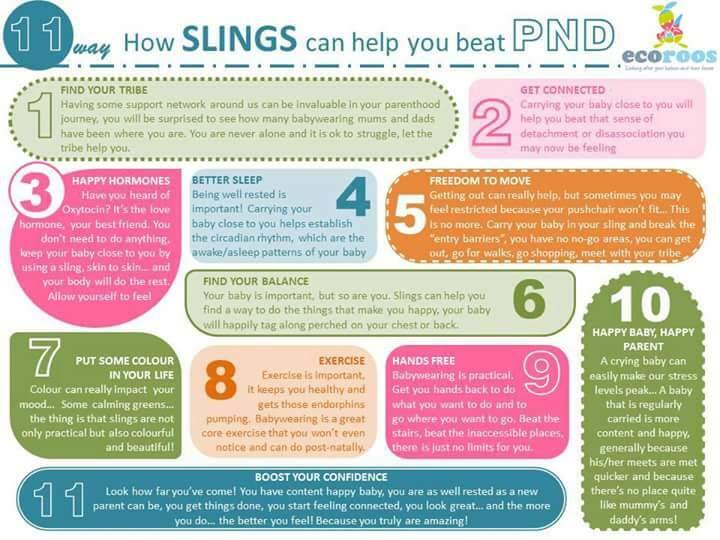 Lack of energy – Whilst you should never sleep with your baby in a sling, use of slings has been shown to reduce crying in the baby, therefore allowing you more opportunity to rest and relax. While your baby is settled in the sling it is the ideal time to try and settle yourself, maybe put your feet up with a cup of tea, read a book or watch TV. I’m not saying this will cure the exhaustion that comes with depression, but that the ability to be calm, even for a short time, may help prevent a deterioration. It may also be that your baby will settle for another caregiver in a sling, giving you more time to properly rest, and sleep. 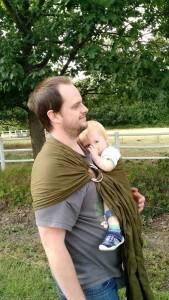 Difficulty bonding with the baby – This is a major one that babywearing can help with. By having your baby with you while you go about your life it can be easier to feel they have joined you in life, rather than taken you away from your previous life, which could lead to resentment. I found that having Reu so close to my face meant I talked to him all the time and could pick up on even his subtle signals much easier than I could if he were at a distance from me. This constant two way communication enabled us to get to know each other quickly, and form the strong bond that we have today. Oxytocin release plays a major part in bonding and attachment between parents and babies, and this is released during skin to skin contact and during social interaction (as well as at other times). So by carrying your baby you are increasing the release of oxytocin which can help reduce stress and anxiety, and therefore help with postnatal depression. Low self confidence, feeling helpless, guilty and unable to cope – these are all very complex emotions, and the roots of these feelings in each different person can be very individual. If these feeling are with regard to the baby and the parents abilities to care for them, then babywearing could help by leading to a more settled baby whose cues the parents could become more familiar with so that the baby’s needs could be meet before they become upset. This in turn could lead to greater confidence in the parents capabilities in caring for the baby, decreased guilt over not understanding what the baby needs, decreased feelings of helplessness from the achievement of a contented baby whose needs the parents have met, and therefore increased confidence in their ability to cope. Irritability – It has been shown that babies cry less when carried, and I would suggest that a decrease in crying could also aid with a decrease in triggers for irritability in the depressed parent. Anxiety, panic attacks and feeling overwhelmed – Again, these are complex emotions and the triggers for one person can be very different from the triggers for someone else. The decrease in crying through sling use could be helpful for some sufferers, if these emotions are triggered in this way. For others (myself included), sling use can help you feel like you have an easy escape if required. So that if feelings of anxiety start to build in a certain situation (for instance a crowded shop), then you know you can get out of that situation if needed, easier with your child in a sling than you would be able to with them in a buggy, which can be hard to navigate through crowds and obstacles such as doors, especially when you are feeling overwhelmed already. 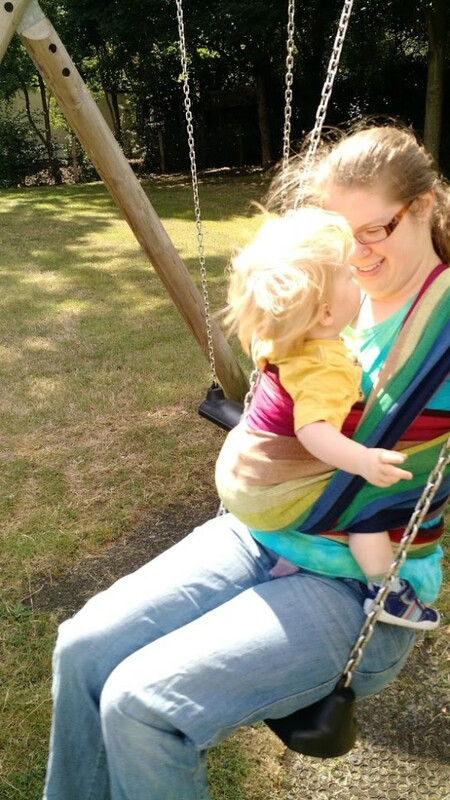 I also found having Reu in a sling decreased my anxiety by making me feel that we were in our own little safety bubble together, and that if people spoke to us it would generally be to him or about him, so that I felt less vulnerable in these situations. Feeling alone and unrealistic expectations of motherhood – When you have a new baby it can be very easy to feel alone in the challenges. You will often spend a lot of time on your own with your baby, who to start with won’t provide much reciprocal interaction for you, which can be very hard. Add depression in and these feelings of being alone and like you are the only person struggling can be further amplified. There can also be problems caused by social media, as people tend to only post the good times on their profile pages, so that when you are sat alone at home, feeling like it’s all a bit too much, and you check in to social media you can wrongly be given the impression that everyone else is having a wonderful and easy time. By babywearing, you may find it easier to get out of the house and to meet other new parents, and realise that you’re not the only person feeling how you do. It can be so helpful to find a group of fellow parents who are open and honest with each other about the difficult times as well as the good. 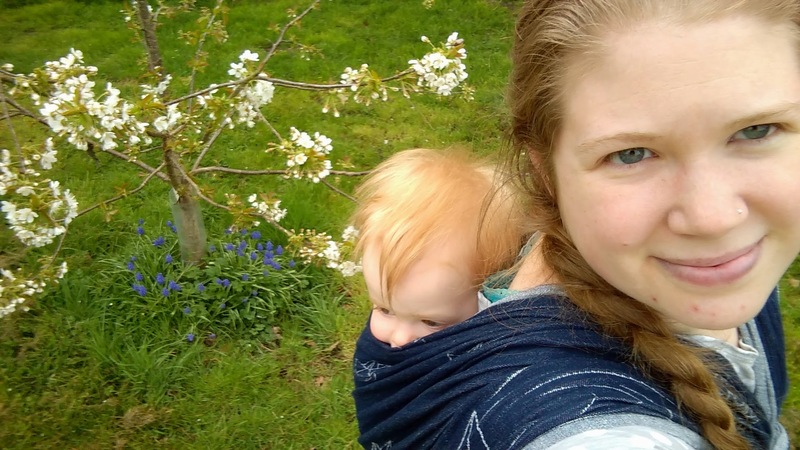 I have found that through babywearing I have become part of a very caring and supportive on-line community, as well as making more local connections through sling meets and groups. I’d also like to discuss some ways that babywearing can help sufferers of depression to carry out various self care treatment methods. These are all treatments recommended as things the sufferer can do themselves to help their mood, either alongside medications and talking therapies such as cognitive behaviour therapy or mindfulness, or as a first step approach, depending on the severity of the depression. Again, I’d like to stress that if you are at all concerned that you may be suffering from any kind of depression, then please see your Doctor. Exercise – For some people suffering from postnatal depression the thought of having to put up a buggy in a car park or manoeuvre one out of the house can be daunting enough that they may not go out for a walk or other exercise as a result. It can be less daunting for some to pre tie a stretchy wrap or similar so that when they arrive at their destination, or want to leave the house, they can just pop the baby in with minimal hassle. Stretchy wraps are ideal for newborns up to about six months as you can put them on in the morning and leave them on all day, popping the baby in and out as required with minimal hassle. 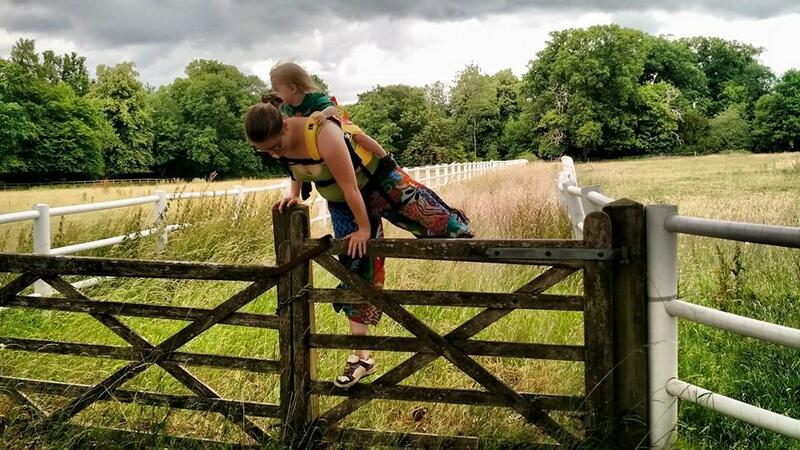 The ability to easily manoeuvre around obstacles such as kerbs and gates can also make going for a walk while babywearing a less daunting prospect than with a buggy. Slings can also leave you hands free so that you can safely care for any older children you have while out and about. There are also now exercise classes such as Sling Swing where you exercise with your baby in a sling, which can aid with meeting other local parents, as well as getting some exercise. Rest as much as possible – This can be very difficult with a new baby, but as mentioned previously, you may find that your baby will settle more in a sling than away from you, allowing you to put your feet up and rest together for a while. You may also find that through the use of slings, your baby is happier to settle on another caregiver such as a family member or friend, and that this could allow you time for a proper break and maybe even some sleep. Self care – Finding time to look after yourself as well as a child of any age can be very difficult, and this is certainly something I struggle with. But through hands free sling use you may find it easier to undertake self care, such as brushing your hair, cleaning teeth etc. Something I haven’t tried but would do with any future baby is showering with your baby in a water sling with you, as showering can become quite a stressful occasion when your baby doesn’t like to be apart from you (again, a completely understandable reaction from them). Eat well – Another self care aspect that can be very difficult while caring for a small child is eating well. Again, the hands free and settled baby aspects of babywearing can be a very important help here. If you’re stuck on the sofa under a sleeping baby and don’t dare move in case you wake them and they cry, you are not making yourself something healthy for lunch and maintaining your blood glucose levels. So by having your baby settled in the sling with you, you are able to feed yourself appropriately, rather than just grab the first thing you find (as so many of us have done), or not eat at all (also guilty). Do something for you – Whatever this may be, reading, listening to music, walking, crafting, most things in life are easier when you have both hands available to you. Socialise, especially with others experiencing the same changes – This can be made easier by a variety of the previously mentioned methods. Being hands free, having a more settled baby so you can have a conversation, ease of getting out and about. 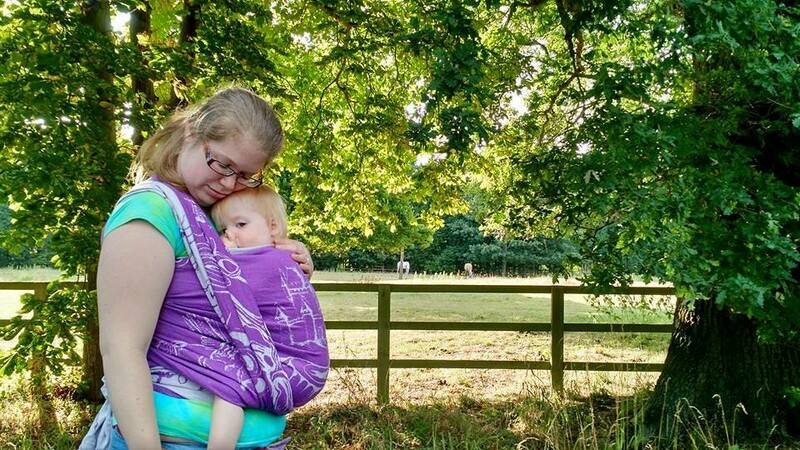 There is also a really lovely and supportive babywearing community, both online and offline, who you may find yourself involved with through using slings. Managing stress – A calmer baby can lead to a calmer parent, and as mentioned earlier, a common stress in parenthood is being overwhelmed by everything that needs to be done. 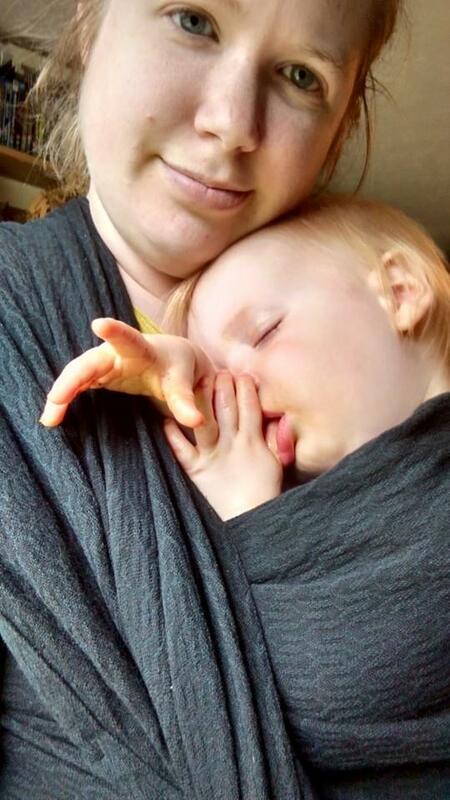 Babywearing can enable you to get some of these things done (washing etc), while still meeting your baby’s needs, therefore decreasing your stress levels. Stress however is a very individual feeling, and people have different stresses to each other, so each person should always be treated and respected as an individual. Practice relaxation techniques – Now this can be difficult with a baby around, but you may find that when your baby is settled in the sling you can take that opportunity to practice a relaxation technique, such as mindfulness. I have managed to practice some mindfulness meditations while Reu has been in a sling on me, whereas I would otherwise have struggled to find the peaceful time for this. It may also be that your baby will settle in a sling for someone else, such as a family member or friend, and that this will allow you time to practice relaxation techniques. Managing change – As touched upon earlier, change can be a large factor in depression of any kind, and a new baby inevitably leads to a lot of change. 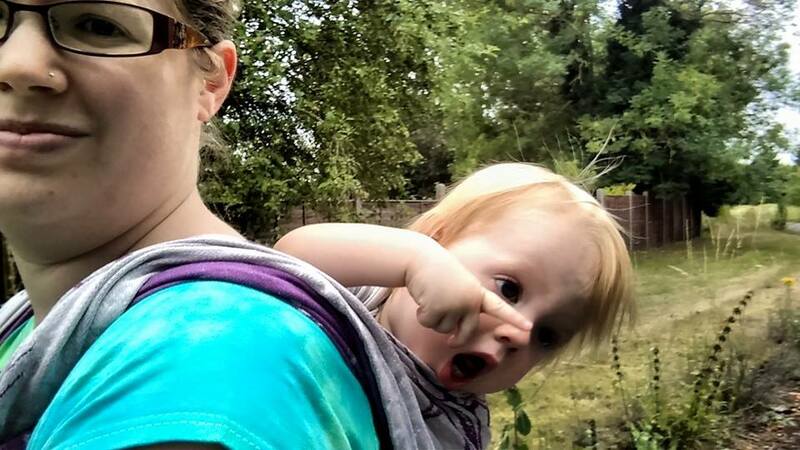 By babywearing, you may find that you are still able to do some of the things you previously did, thereby softening the sudden and drastic changes that can otherwise occur. Greater attachment – Greater attachment between parent and baby can lead to both feeling more secure in their place in the world and therefore less stressed. Parents with a greater attachment to their babies (and slings can help with this), are more able to pick up on their cues sooner, and therefore meet their needs leading to satisfied babies and happier parents. Babies that know their needs will be met are less likely to cry which can reduce stress in the parent as well as the child. Breastfeeding – Some studies have suggested that a lack of breastfeeding can be a risk factor for postnatal depression. 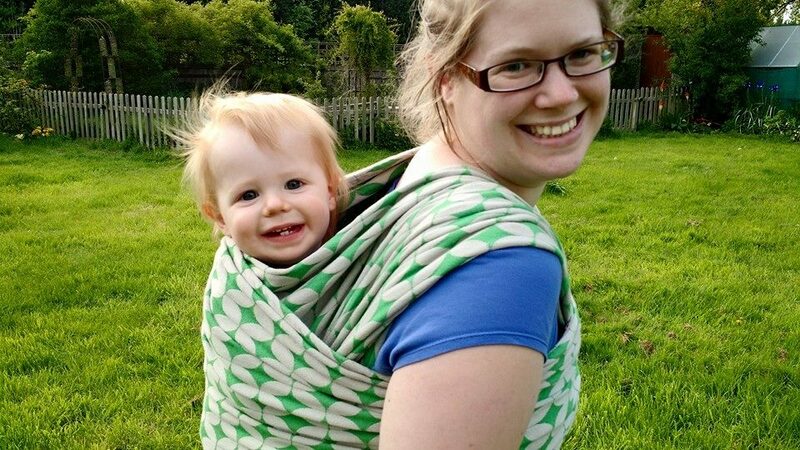 The use of slings has been shown to aid breastfeeding establishment, so this is another way that babywearing may be of use for postnatal depression prevention. Type postnatal depression and babywearing into Google and you will find a lot of blog posts and articles about how babywearing has helped individuals like me cope with postnatal depression. Through my Facebook page I also frequently hear from people who have found their recovery from depression helped by the use of slings. I asked on my page if anyone could provide me with quotes for this talk of their own experiences, and I was blown away with the response! So here they all are. I have also provided links to some articles for those who wish to read further. “It helped me stay connected to my baby when mentally I felt very disconnected. He got closeness even though I didn’t feel close to him. So he didn’t miss out due to my illness”. “When I fell pregnant with my baby, I was not happy. I was suffering depression badly, I was always sick, there was so many bad things happening and I worried when my baby was born, he would grow feeling as though he was never loved, because of how I felt during the pregnancy. After baby was born, I carried him from day 3, for 12-24 hours…non stop every single day. I wanted him to be close to me so he knew I loved him with all my heart and that that he would never go through any day feeling he wasn’t loved. I will wear him until he is too heavy to be worn, or no longer wants to be, and then I will make him a blanket with the wraps we have at the end so he can always have the memory of our wearing days close to him, and will feel the love and warmth from our bond, for always. Babywearing has been what saved me from the darkness that is PND and PNA. 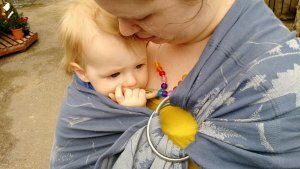 I found support from the Babywearing community, locally, as well as internationally. 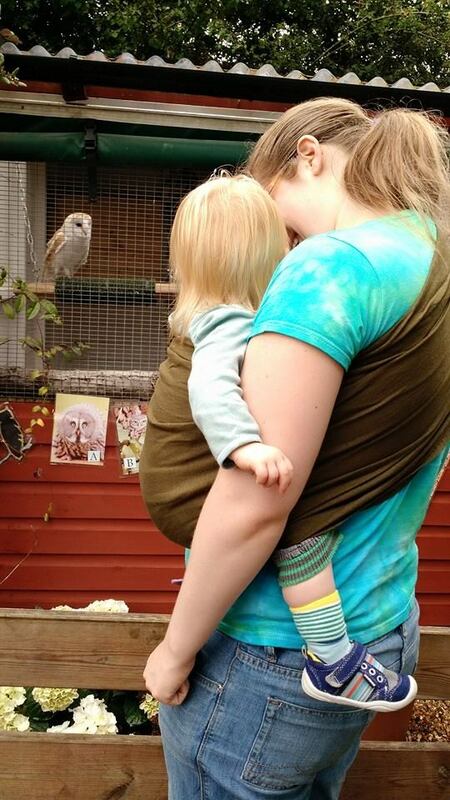 I found the Babywearing community became my village. When I can’t cope, when life is too much, they are there and care with as much love and understanding as you would get from family. “Bowel disease, locked in the house, no escape without panic, PND convinced me I couldn’t go out, I would be stuck in town in a pool of my own filth with a crying baby, no breastfeeding too much medication, no milk, horrible guilt. 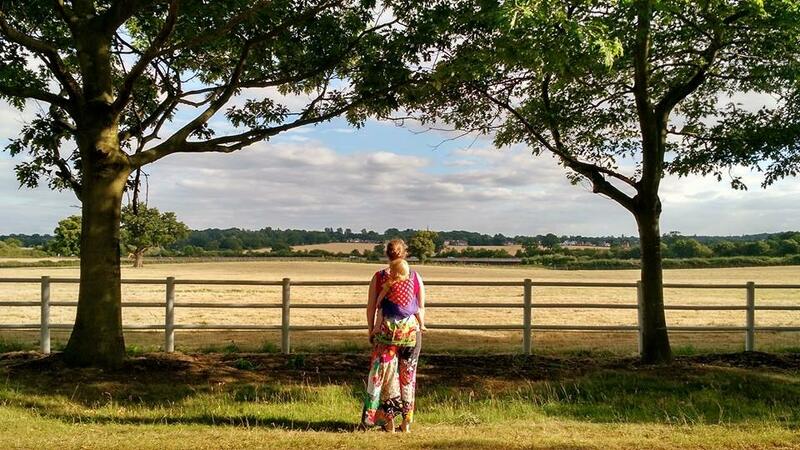 My pregnancy was bleak, hyperemesis from start to end; I wanted a home birth from day 1 but was told time after time scan after scan consultant after consultant ‘NO’. I had lost all control and the black clouds rolled in. I needed control of my body and baby so I did research and fought tooth & nail literally until hours before the birth.. My son was born in a pool at home. I was happy. 2 weeks in I was swallowed in silent reflux, sleepless nights a screaming unhappy baby and PND engulfed me like a wildfire. I lost all control, I lost myself. I was crying non stop so unhappy so alone I didn’t want to leave the house. Spring was emerging but I was hiding. I saw Facebook photos of people all happy and it upset me more except for photos of my friend wearing her daughter. She was so honest and open about her baby battles but wearing her baby made her happy, made them both smile so I dusted off my wrap and out I went! I walked and walked I picked up my girls from school and I realised how settled he was being worn. I got a break from reflux, from sick, from tears and he slept!!!! I loved that time. I could hold my daughter’s hand to cross the road I could think straight I could enjoy my music on walks. I could take photos and I could feel his calm and beautiful sleep. He had me I had him but I had myself back! I was winning again. I got a connecta and I loved the dinosaur print. My son loved the mummy hugs and we both loved his naps. I got so many compliments and it got me talking to people and like I was doing the best for everyone. I felt special too it was a great gift. I passed on my love of wearing to 3 friends who I now see wearing their babies and I’m so happy I could explode. I know on bad days I can pop him in a carrier and peace will be restored and my sanity with it. I adored my holiday in the north York moors carrying him, taking selfies smugly getting to all the highest peaks, the tightest spots that buggies can’t reach. I took wonderful photos with my free hands, I climbed rocks and scaled cobbled paths and helped my daughters climb trees and build sand castles and explore museums. The vibrant patterns match my personality, the versatility matches my lifestyle. The freedom frees me from my prison at home where I would wallow and cry. It takes away his discomfort which made me question my parenting ability, he’s happy next to my heart, curled up secure and loved. He loves me for wearing him. My friends get to see me enjoying the special bond we have formed and my husband can see his wife again being a happy person. He might not like the price I paid for them he might not see why I need so many but the cost is so little compared to the postnatal depression he nearly lost me to. I wear my baby with pride, I show him off daily and the exercise lifts my mood even on a dark day which still happens every now and then. 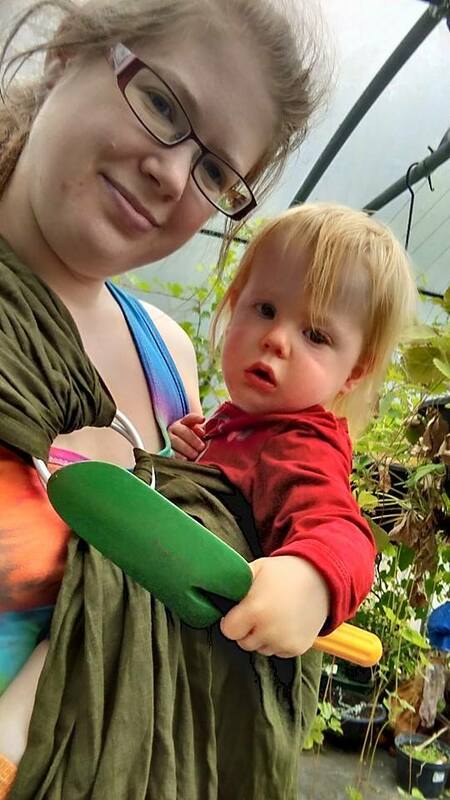 I love to talk to people about babywearing, I love to see people enjoy it too and I feel part of something special but still unique and different.